Background/aim: In recent years, the increase in the prevalence of carbapenem-resistant Enterobacter cloacae (CREC) has been significant and has become a global problem. The aim of this study is to characterize CREC extended spectrum &beta;-lactamases (ESBLs) and CREC carbapenemase genes and evaluate the risk factors for CREC infections in a university hospital in China. Materials and methods: The identification and assessment of the antimicrobial susceptibility of CREC isolates were performed using a VITEK-2 compact system. Clonal relatedness was investigated by pulsed-field gel electrophoresis (PFGE). &beta;-Lactamase genes were examined using polymerase chain reaction and nucleotide sequencing. Results: A total of 64 CREC isolates were included in the study. The rate of CREC infections significantly increased between 2009 and 2012. Among the CREC isolates, 39 (60.9%) isolates possessed ESBL genes, and 49 (76.6%) carried carbapenemase genes; blaSHV-12 and blaKPC-2 were the most common genes, respectively. PFGE showed that there were no obvious clonal associations between these CREC isolates, except for 3 isolates. A univariate analysis demonstrated that prior treatment with antibiotics, intravascular catheterization, urinary catheterization, mechanical ventilation, and parenteral nutrition were significant risk factors for CREC infections. Conclusion: The emergence and increase of CREC infections is worrisome. Effective measures should be taken to control the spread of CREC. Yang FC, Yan JJ, Hung KH, Wu JJ. Characterization of ertapenem–resistant Enterobacter cloacae in a Taiwanese university hospital. J Clin Microbiol 2012; 50: 223–226. Patel G, Huprikar S, Factor SH, Jenkins SG, Calfee DP. Outcomes of carbapenem-resistant Klebsiella pneumoniae infection and the impact of antimicrobial and adjunctive therapies. Infect Control Hosp Epidemiol 2008; 29: 1099–1106. Marchain D, Navon-Venezia S, Schwaber MJ, Carmeli Y. Isolation of imipenem-resistant Enterobacter species: emergence of KPC-2 carbapenemase, molecular characterization, epidemiology, and outcomes. Antimicrob Agents Chemother 2008; 52: 1413–1418. Souli M, Galani I, Antoniadou A, Papadomichelakis E, Poulakou G, Panagea T, Vourli S, Zerva L, Armaganidis A, Kanellakopoulou K et al. An outbreak of infection due to beta- Lactamase Klebsiella pneumoniae carbapenemase 2-producing K. pneumoniae in a Greek university hospital: molecular characterization, epidemiology, and outcomes. Clin Infect Dis 2010; 50: 364–373. Monteiro J, Santos AF, Asensi MD, Peirano G, Gales AC. First report of KPC-producing Klebsiella pneumoniae strains in Brazil. Antimicrob Agents Chemother 2009; 53: 333–334. Peirano G, Seki LM, Val Passos VL, Pinto MCFG, Guerra LR, Asensi MD. Carbapenem-hydrolysing β-lactamase KPC-2 in Klebsiella pneumoniae isolated in Rio de Janeiro, Brazil. J Antimicrob Chemother 2009; 63: 265–268. Iabadene H, Messai Y, Ammari H, Ramdani-Bouguessa N, Lounes S, Bakour R, Arlet G. Dissemination of ESBL and Qnr determinants in Enterobacter cloacae in Algeria. J Antimicrob Chemother 2008; 62: 133–136. Clinical and Laboratory Standards Institute. Performance Standards for Antimicrobial Susceptibility Testing, 21st Informational Supplement 2011, M100-S21. Wayne, PA, USA: Clinical and Laboratory Standards Institute; 2011. Xia Y, Liang Z, Su X, Xiong Y. Characterization of carbapenemase genes in Enterobacteriaceae species exhibiting decreased susceptibility to carbapenems in a University Hospital in Chongqing, China. Ann Lab Med 2012; 32: 270– 275. Tenover FC, Arbeit RD, Goering RV, Mickelsen PA, Murray BE, Persing DH, Swaminathan B. Interpreting chromosomal DNA restriction patterns produced by pulsed-field gel electrophoresis: criteria for bacterial strain typing. J Clin Microbiol 1995; 33: 2233–2239. Gupta N, Limbago BM, Patel JB, Kallen AJ. Carbapenem- resistant Enterobacteriaceae: epidemiology and prevention. Clin Infect Dis 2011; 53: 60–67. Yang Q, Wang H, Sun H, Chen H, Xu Y, Chen M. Phenotypic and genotypic characterization of Enterobacteriaceae with decreased susceptibility to carbapenems: results from large hospital-based surveillance studies in China. Antimicrob Agents Chemother 2010; 54: 573–577. Logan LK. Carbapenem-resistant Enterobacteriaceae: an emerging problem in children. Clin Infect Dis 2012; 55: 852– 859. Munoz-Price LS, De La Cuesta C, Adams S, Wyckoff M, Cleary T, McCurdy SP, Huband MD, Lemmon MM, Lescoe M, Dibhajj FB et al. Successful eradication of a monoclonal strain of Klebsi- ella pneumoniae during a K. pneumoniae carbapenemase- producing K. pneumoniae outbreak in a surgical intensive care unit in Miami, Florida. Infect Control Hosp Epidemiol 2010; 31: 1074–1077. Karah N, Haldorsen B, Hermansen NO, Tveten Y, Ragnhildstveit E, Skutlaberg DH, Tofteland S, Sundsfjord A, Samuelsen Ø. Emergence of OXA- carbapenemase-and 16S rRNA methylase- producing international clones of Acinetobacter bau mannii in Norway. J Med Microbiol 2011; 60: 515–521. Correa L, Martino MD, Siqueira I, Pasternak J, Gales AC, Silva CV, Camargo TZ, Scherer PF, Marra AR. A hospital-based matched case-control study to identify clinical outcome and risk factors associated with carbapenem-resistant Klebsiella pneumoniae infection. BMC Infect Dis 2013; 13: 80. Fernández A, Pereira MJ, Suárez JM, Poza M, Treviño M, Villalón P, Sáez-Nieto JA, Regueiro BJ, Villanueva R, Bou G. Emergence in Spain of a multidrug-resistant Enterobacter cloacae clinical isolate producing SFO-1 extended- spectrum beta-lactamase. J Clin Microbiol 2011; 49: 822–828. Routsi C, Pratikaki M, Platsouka E, Sotiropoulou C, Papas V, Pitsiolis T, Tsakris A, Nanas S, Roussos C. Risk factors for carbapenem-resistant Gram-negative bacteremia in intensive care unit patients. Intensive Care Med 2013; 39: 1253–1261. Hirsch EB, Tam VH. Detection and treatment options for Klebsiella pneumoniae carbapenemases (KPCs): an emerging cause of multidrug-resistant infection. J Antimicrob Chemother 2010; 65: 1119–1125. Giakkoupi P, Pappa O, Polemis M, Vatopoulos AC, Miriagou V, Zioga A, Papagiannitsis CC, Tzouvelekis LS. Emerging Klebsiella pneumoniae isolates coproducing KPC-2 and VIM- 1 carbapenemases. Antimicrob Agents Chemother 2009; 53: 4048–4050. Zhou T, Zhang X, Guo M, Ye J, Lu Y, Bao Q, Chi W. Phenotypic and molecular characteristics of carbapenem-non-susceptible Enterobacteriaceae from a teaching hospital in Wenzhou, southern China. Jpn J Infect Dis 2013; 66: 96–102. Nedjai S, Barguigua A, Djahmi N, Jamali L, Zerouali K, Dekhil M, Timinouni M. Prevalence and characterization of extended spectrum beta- lactamase- producing Enterobacter cloacae strains in Algeria. J Infect Dev Ctries 2013; 7: 804–811. Chen CH, Huang CC. Risk factor analysis for extended- spectrum β-lactamase-producing Enterobacter cloacae bloodstream infections in central Taiwan. BMC Infect Dis 2013; 13: 417. Khalaf NG, Eletreby MM, Hanson ND. Characterization of CTX-M ESBLs in Enterobacter cloacae, Escherichia coli and Klebsiella pneumoniae clinical isolates from Cairo, Egypt. BMC Infect Dis 2009; 9: 84. Paterson DL. The molecular epidemiology of extended- spectrum beta-lactamase producing organisms. Enferm Infecc Microbiol Clin 2008; 26: 403. Patel G, Bonomo RA. Status report on carbapenemases: challenges and prospects. Expert Rev Anti Infect Ther 2011; 9: 555–570. Nordmann P, Cuzon G, Naas T. The real threat of Klebsiella pneumoniae carbapenemase-producing bacteria. Lancet Infect Dis 2009; 9: 228–236. Nordmann P, Dortet L, Poirel L. Carbapenem resistance in Enterobacteriaceae: here is the storm Trends Mol Med 2012; 18: 263–272. Perez F, Van Duin D. Carbapenem-resistant Enterobacteriaceae: a menace to our most vulnerable patients. Cleve Clin J Med 2013; 80: 225–233. Cantón R, Akóva M, Carmeli Y, Giske CG, Glupczynski Y, Gniadkowski M, Livermore DM, Miriagou V, Naas T, Rossolini GM et al. Rapid evolution and spread of carbapenemases among Enterobacteriaceae in Europe. Clin Microbiol Infect 2012; 18: 413–431. ISNAD CUI, LANYING , ZHAO, JINGYING , LU, JUAN . "Molecular characteristics of extended spectrum Ã-lactamase and carbapenemase genes carried by carbapenem-resistant Enterobacter cloacae in a Chinese university hospital". 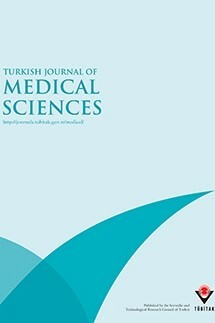 Turkish Journal of Medical Sciences 45 / 6 (December 2015): 1321-1328.